Anyone who has ever thought about studying law in Europe, this post will be of particular interest to you. Back at the start of the semester, Dr Sara Ramshaw from Queen’s University Belfast was visiting UBC all the way from Northern Ireland and she was kind enough to sit down with a couple of Pre-Law members to pass on some useful information about Queen’s Law program. Dr Ramshaw is actually one of the admissions personnel for the School of Law, so she was able to tell us first hand as to what the university is looking for in applications. For anyone who is unfamiliar with Belfast, it is an area located in Northern Ireland. Queen’s University has been internationally recognized as one of the top UK Law Schools for a number of years in a row and offers students a 3 year Juris Doctor degree. Dr Ramshaw mentioned that International students are especially welcome to apply as there are scholarships available and local agencies work with the university to provide internships to international students. International students are also guaranteed accommodation for at least their first year. The small-group intensive teaching strategies used in this program allow students to be actively engaged in their learning and to thrive off each other’s knowledge. For me personally, small classrooms are one of my top priorities when choosing a law school as getting to know my professors and colleagues really helps stay focused and engaged in my learning, as my undergrad experience has shown. The entry requirements are a 3.0 / 4.0 GPA in a primary degree other than law, supporting paperwork such as a personal statement and a letter of recommendation and that is pretty much it. Yes, you read that right…. no LSAT exam score is required! Belfast has a history of having political instability and when we asked Dr Ramshaw about this, she assured us that the area was recently named the safest region in the UK (British Crime Survey 2011). 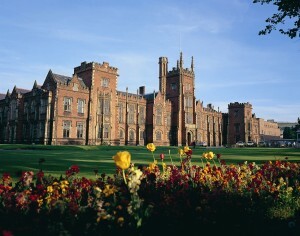 The university is actually situated in a quiet residential suburb close to the Belfast city-centre. Most major United Kingdom cities are located within an hour’s flying time and there is also a daily ferry which provides fast transportation services to wherever you may want to explore that day.